How does SwipeClock integrate with iSolved? [/vc_column_text][divider line_type=”No Line” custom_height=”20″][image_with_animation image_url=”11284″ alignment=”center” animation=”Fade In” box_shadow=”none” max_width=”100%”][divider line_type=”No Line” custom_height=”20″][vc_column_text]SwipeClock® is an online time and attendance solution for businesses, both large and small. It defines practicality in today’s timekeeping industry, offering simple hardware setup, exceptional user-ease, and affordability to businesses of all sizes. Through SwipeClock’s web-based service, employers can automate the process of collecting and calculating time card data for payroll, and payroll providers can automate the process of collecting timekeeping data while increasing revenue generated from their payroll package. 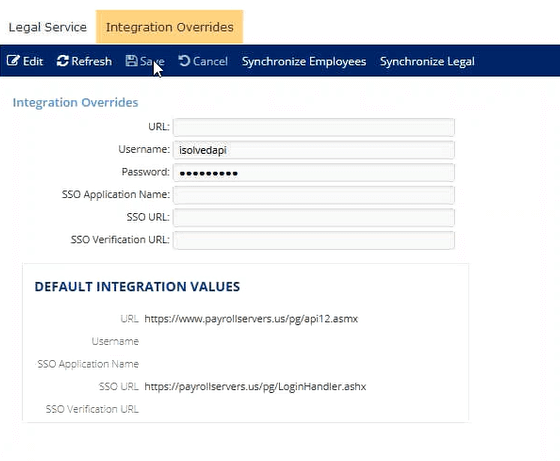 TimeWorksPlus integrates with the iSolved HCM platform for both employee data and employee SSO to the Employee Self Service portal. This article explains the nature of the integration and the setup. With the integration enabled, employee data in iSolved syncs to TimeWorksPlus, eliminating the need for redundant employee data entry. iSolved serves as the system of record for the data and overwrites any existing data in TimeWorksPlus. Employee data does not pass from TimeWorksPlus to iSolved. The integration is a one-way sync. The integration also facilitates employee access to TimeWorksPlus via a single sign-on. The Employee Self Service portal in TimeWorksPlus contains WebClock, time off requests, schedules, an accruals report and notifications. There is no single sign-on access for managers or supervisors through iSolved. [/vc_column_text][divider line_type=”No Line” custom_height=”20″][vc_row_inner column_margin=”default” text_align=”left”][vc_column_inner column_padding=”no-extra-padding” column_padding_position=”all” background_color_opacity=”1″ width=”1/2″ column_border_width=”none” column_border_style=”solid”][info_list font_size_icon=”24″ connector_color=”#ffffff”][info_list_item list_title=”Single Sign On (SSO)” list_icon=”Defaults-user”]No need to memorize multiple logins for iSolved and TimeWorksPlus. [/info_list_item][info_list_item list_title=”Improve Client Retention” list_icon=”Defaults-group users”]When your clients use Time & Attendance integrated with their Payroll system you will see improved client stickiness. [/info_list_item][/info_list][/vc_column_inner][vc_column_inner column_padding=”no-extra-padding” column_padding_position=”all” background_color_opacity=”1″ width=”1/2″ column_border_width=”none” column_border_style=”solid”][info_list icon_color=”#262f3f” font_size_icon=”24″ connector_color=”#ffffff”][info_list_item list_title=”Integration with iSolved HCM” list_icon=”Defaults-sign-in”]Push data directly out of iSolved and into Swipeclock’s TimeWorksPlus. Once the simple setup is complete your employee data will sync automatically. [/info_list_item][/info_list][/vc_column_inner][/vc_row_inner][divider line_type=”No Line” custom_height=”20″][ult_buttons btn_title=”BECOME A PARTNER” btn_link=”url:%2Fbecome-a-partner%2F|||” btn_align=”ubtn-center” btn_size=”ubtn-large” btn_title_color=”#ffffff” btn_bg_color=”#00c070″ icon_size=”32″ btn_icon_pos=”ubtn-sep-icon-at-left”][/vc_column][/vc_row][vc_row type=”in_container” full_screen_row_position=”middle” scene_position=”center” text_color=”dark” text_align=”left” overlay_strength=”0.3″][vc_column column_padding=”no-extra-padding” column_padding_position=”all” background_color_opacity=”1″ background_hover_color_opacity=”1″ column_shadow=”none” width=”1/1″ tablet_text_alignment=”default” phone_text_alignment=”default” column_border_width=”none” column_border_style=”solid”][toggles style=”default”][toggle color=”Default” title=”How do I Enable the iSolved Integration?”][vc_column_text]Most of the integration setup is done in iSolved, but before you begin, you will need to create a client level login in TimeWorksPlus (figure 1). That login and password is used specifically for the integration and should not be used by any actual users. For each iSolved client you are setting up with the integration, you will need a specific login created in each TimeWorksPlus account. Access the client’s Legal Services page. Select Swipeclock – TWP from the list of legal services. Check the Swipeclock – TWP checkbox to enable and click Save. Select the Integrations Overrides tab (figure 3). 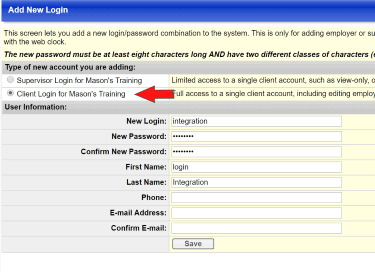 Enter the TimeWorksPlus client login and password. These are the credentials created specifically for the integration. Leave the other fields blank. The integration uses the listed Default Integration Values. Only if you have unique URLs for SwipeClock should you fill in the remaining fields. Integrations Overrides is where the TWP credentials are entered. Once service is setup, the sync will start immediately. iSolved will overwrite any data in TimeWorksPlus that differs from iSolved. From that point forward, the data sync will occur anytime a change is made to the employee record in iSolved or an employee is added to iSolved. Select Full Access for both Access EE TimeWorksPlus and Access ESS TimeWorksPlus. This step takes 1 day to process before it is enabled. Also, make sure that the role is enabled in Client Management->Client Utilities->Self Service Roles. [/vc_column_text][/toggle][toggle color=”Default” title=”What Data Syncs Between iSolved and SwipeClock? “][image_with_animation image_url=”11257″ alignment=”” animation=”None” img_link_large=”yes” box_shadow=”none” max_width=”100%”][vc_column_text]The Supervisor Search can be the supervisor’s employee ID from iSolved. It will be used to populate the employee’s “Supervisor” field in Swipeclock. In order for Department to be passed to TimeWorksPlus, the Organizational Field in iSolved has to be called “Department”. [/vc_column_text][/toggle][toggle color=”Default” title=”How do I View an Employee in SwipeClock?”][image_with_animation image_url=”11258″ alignment=”” animation=”None” img_link_large=”yes” box_shadow=”none” max_width=”100%”][vc_column_text]To view the employees within SwipeClock, log into TimeWorksPlus with your manager or supervisor login. 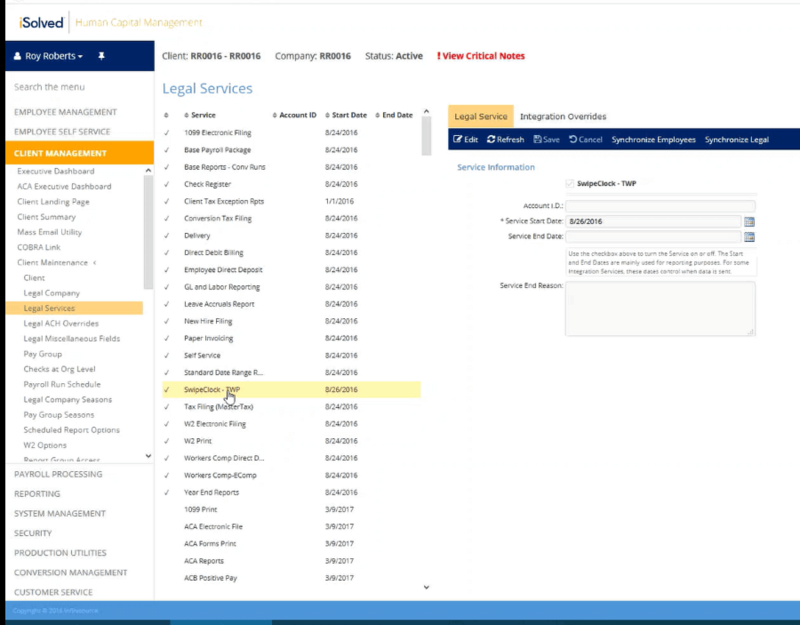 Then click on “Employee Setup” from the left-hand column. Then, click on the name of an employee to view their information in more detail. You can then fill out any additional details within the SwipeClock interface. Your client can access timekeeping in the same manner. 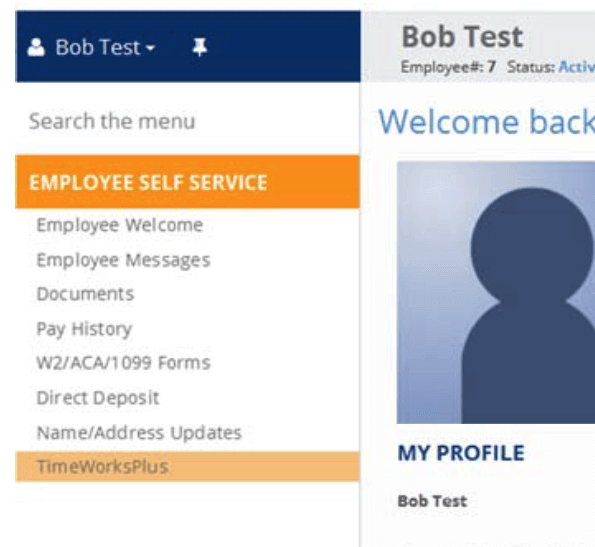 With the ESS access enabled, an employee will have a TimeWorksPlus menu item in their Employee Self Service (Figure 5). The first time the user selects TimeWorksPlus, they will be redirected to a SwipeClock page and their account credentials will be created. This can take up to 30 seconds. After that initial access, the user will be redirected to their personal SwipeClock page each time they use the TWP menu item. [/vc_column_text][/toggle][toggle color=”Default” title=”Where do I go for Support for this Integration?”][vc_column_text]If you are an existing customer using this integration, please be aware that this integration is supported by iSolved. For support regarding this integration, please contact iSolved’s support team by phone: 800-733-8839. [/vc_column_text][/toggle][/toggles][/vc_column][/vc_row][vc_row type=”in_container” full_screen_row_position=”middle” scene_position=”center” text_color=”dark” text_align=”left” overlay_strength=”0.3″][vc_column column_padding=”no-extra-padding” column_padding_position=”all” background_color_opacity=”1″ background_hover_color_opacity=”1″ column_shadow=”none” width=”1/1″ tablet_text_alignment=”default” phone_text_alignment=”default” column_border_width=”none” column_border_style=”solid”][vc_column_text]What’s Next? Would you like to learn more about our API? Check out our new TimeWorksTouch Clock.